ক. 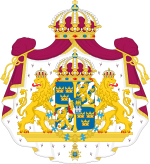 ^ "För Sverige – I tiden" has been adopted by Carl XVI Gustaf as his personal motto. খ. ^ Du gamla, Du fria has never been officially adopted as national anthem, but is so by convention. গ. ^ Since 1 July 2009. 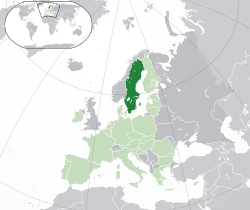 Five other languages are officially recognized as minority languages: Finnish, Meänkieli, Romani, Sami, and Yiddish. The Swedish Sign Language also has a special status. ঘ. ^ On 31 December 2012[হালনাগাদ], approximately 27% of the population had a full or partial foreign background. ঙ. ^ Since 3 September 1967. চ. ^ The .eu domain is also used, as it is shared with other European Union member states.